Ross Chamberlain scored a try for Borough. It was business as usual at Fengate this afternoon (March 23) as Borough cruised to another English Clubs Championship win. 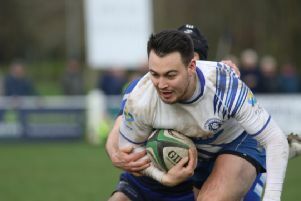 They entertained Midlands Division One strugglers Leighton Buzzard and shone in the spring sunshine to run out handsome 33-12 winners. Stuart Day scored a try for Borough. Right from the off they were the dominant force and it was always a case of not whether they’d win but by how many. Buzzard were gutsy and had a couple of very tasty runners but as a team they were no match for a rampant Borough side superbly led by captain Stuart Day and player/coach Sam Crooks. Those two, along with number eight Zak McClure, were into everything while outside Borough also had a couple of aces in scrum-half Ross Chamberlain and strong running centre George Offer. It was McClure who bagged the first of Borough’s five tries when he latched on to a neat pass from Chamberlain after Borough had won a scrum five metres out. That was in the second minute and five minutes later they scored again. This time it was Day seen charging over the line after taking a scoring pass from Rob Mould. Matt Newman added both conversions and Borough were firmly in the driving seat at 14-0. McClure grabbed his second after Scott Mills won a lineout and Newman’s conversion made it 21-0 with half-an-hour gone. 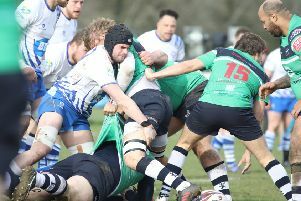 Then on the stroke of half-time Borough grabbed their bonus-point try when Chamberlain picked up from the base of a scrum five metres out and weaved his way through a gap. Borough led 26-0 at half-time and in all honesty it could have been a lot more had it not been for some rather casual handling. Buzzard then had their best spell but 15 minutes of possession close to the Borough try-line reaped no reward. On 57 minutes good work by the Pearce brothers - Dewi and Owain - sent Borough scurrying upfield and the fifth and final try was scored by Crooks under the posts. Newman added the extras and it was 33-0 to Borough. Buzzard scored two late consolation tries in the last 10 minutes. Borough: N. Langton, O. Pearce, M. Bean, G. Offer, M. Tshepo-Olebile, M. Newman, R. Chamberlain, D. O’Connell, J. Dingle, S. Day, S. Crooks, S. Mills, R. Mould, L. Swindells, Z. McClure. Subs: A, Throne, D. Pearce, J. Beal. Oundle were at home to rock-bottom Melton Mowbray and romped to a 52-7 win with tries by Luke Sharpley, Will Carrington, James Reid, Harry Winch, Alex Efford, Evan Griffiths, Robb Shingles and Louis Davis. Carrington kicked six conversions. Oundle are fourth in the table and Borough fifth.